Just when the Miami Heat were getting back on track, they may have lost the person they can least afford to be without. Dwyane Wade dislocated his left shoulder late in Miami's 112-102 loss to the Houston Rockets on Wednesday night, though the extent of his injury is not yet known. With Shaquille O'Neal finally healthy and Pat Riley back on the bench, the Heat seemed poised to shake off their early struggles and surge in the second half of the season. Instead the team watched as Wade, with tears in his eyes, was in so much pain that he had to be taken off in a wheelchair in the fourth quarter. "If it's not one thing, it's another," said O'Neal, who has played just 14 games this season because of knee surgery. "We've been through a lot this season." Tracy McGrady scored 32 points to lead the Rockets. The Heat were 13-17 when Riley stepped away nearly seven weeks ago for operations to replace his left hip and repair cartilage in his right knee. They had rebounded recently, winning seven of their last eight games, but trailed by as many as 18 Wednesday and dropped back below .500. "This is the way it's going to be this year I guess," Riley said. "We've had a lot of adversity. Things haven't been going well from the get go." 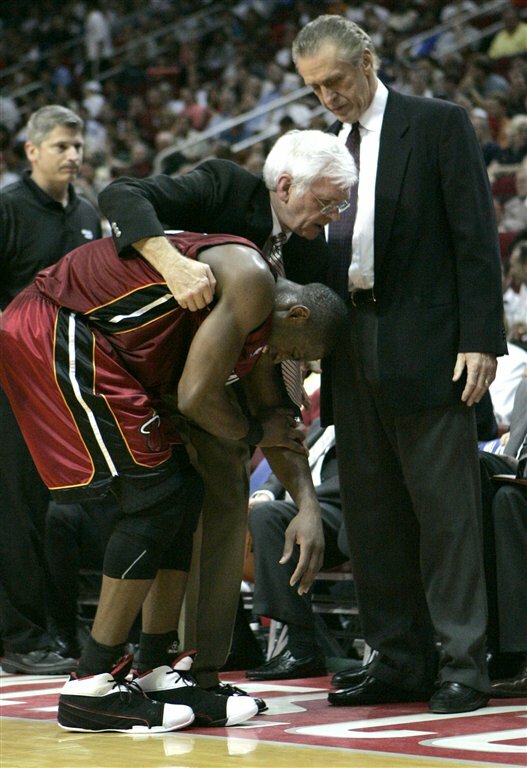 Wade, who left with 27 points, got tangled up with Shane Battier and grimaced in pain before going to the bench. A couple of minutes later he was helped into a wheelchair and taken off the bench. He was not moving his left arm and appeared to be in severe pain as he was wheeled away. "Someone said we locked arms," Battier said. "All I know is Dwyane was on the sidelines grabbing his shoulder. I didn't think it was anything at first. I spun around. I hit somebody. I didn't know what happened." The Heat said Wade would not accompany the team on their trip to Dallas for Thursday night's game, instead going to a Houston hospital to have his injury diagnosed. A basket by Wade with 11:15 to go got Miami within 89-80 and Alonzo Mourning hit one free throw to cut the lead to eight. The Rockets then added four 3-pointers, including two on consecutive possessions by McGrady to go ahead 103-88, and the Heat wouldn't threaten again. Wade scored 13 points in the third quarter, including two straight three-point plays late in the period to cut Houston's lead to 82-74. Bonzi Wells stunned the crowd when he made a 70-foot, desperation heave at the end of the period to extend Houston's lead to 89-75. Wells, who was at the 3-point line on the opposite end of the court when he launched the shot, broke into a huge smile when he saw it fall. "I think he has the ability in these games to give us a lift," Rockets coach Jeff Van Gundy said. "It is hard now trying to figure out how to play him and Shane." Rafer Alston, who had six 3s and 20 points, got the crowd into it early in the second half when he put a move on Wade that left him standing at the free throw line while he breezed in for the easy layup. McGrady tweaked a groin midway through the first quarter and left the game briefly to have it taped. He returned about three minutes later and said at halftime that he was fine. The 40-year-old Dikembe Mutombo looked more spry than the younger O'Neal at times and provided a highlight of the first half when he finished a reverse layup despite being fouled hard by the Miami center. O'Neal finished with 20 points and a season-high 16 rebounds. Late in the game, O'Neal got a bit of revenge when he had a one-handed dunk over Mutombo. But O'Neal taunted him with the trademark finger wag Mutombo does after getting a block and was given a technical foul. Mourning said the Heat can't use Wade's injury as an excuse, regardless of how serious it may be. "It's unfortunate, but you've got to deal with it and move on," he said. "I do know this: We got enough in here to get it done, regardless of if he's out o not. We're deep enough, we've got enough experience. It's just a matter of guys coming mentally and physically prepared every night." O'Neal, who said he feels like he's getting back to his old self, agreed and said he's prepared to step up in Wade's absence. "I have to be more aggressive and get more looks and keep everyone else involved," he said. "Coach is calling my play and if he keeps calling them, I will deliver." The Rockets, spurred by nine quick points by McGrady, went on a 15-4 run in the first quarter that gave them a 18-8 lead. Houston outscored the Heat 9-2 late in the second quarter to push their lead to 63-48 at halftime. Notes:@ Former Rockets coach Rudy Tomjanovich was scouting the game. ... Houston Comets star Sheryl Swoopes attended the game with her young son. The pair sat on the front row and cheered loudly throughout the second half.